The other night I was at a dinner party and the topic of the “American dream” came up. I referred the people at our soirée to a great rant on the topic by the late George Carlin, where he says something like the American dream is a joke and scam and that you have to be asleep to believe it (something like that, anyway). One person said to me, well how do you respond to the reality that people are more financially and materially comfortable than they have ever been and enjoy more freedoms than at any point in history? I will save my comments on how free we may or may not be in the draconian era of “anti-terrorism” laws and NSA-style government surveillance for another post. 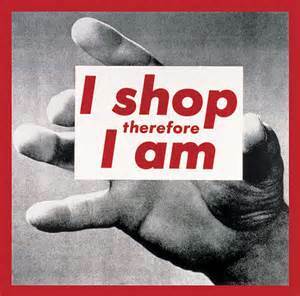 For now, I’d like to say a few things about consumerism. In the west, and especially in North America, consumerism has become a way of life. It’s a new religion of sorts and a raison d’ etre all its own. While buying things is not inherently bad (though there is the question of where things come from, how they’re made, what natural resources are depleted, who makes them, under what working conditions, etc), my response to the guest was that while some westerners may be more materially comfortable than at any point in history, we seem to be highly unhappy. One of my earlier posts discusses the increasing use of “mood disorder” drugs in the west. It seems that the more “comfortable” we become as a culture, the more depression, anxiety and general dis-ease we experience. There may or may not be a direct causal link between consumerism and our social mal-content. Having our basic needs met is very important; but hyper-consumption does not seem to make us happier. Given the argument that we’re more materially comfortable than we’ve ever been (of course, there are millions of people for whom this is not true, but I digress), one might expect modern people to be happier. But consumerism and material objects alone cannot bring lasting happiness, not least because consumerism and advertising are a type of trap or trick that convince us to fill spiritual and emotional voids with material objects. I do not use the word spiritual in a religious sense but rather to describe a sense of connection with other beings and our social and natural worlds as well as the pursuit of deeper truths, etc. Human beings need spiritual and emotional connections and interactions with other people and living things, with nature and our larger world and universe. Connection and interaction—something that is both simple and sublime—is part of our humanity. But in the modern world, people (with all our depths, nuances and complexities) are becoming mere customers and shoppers. While material comforts are necessary to a point, our needs are not just material. Hyper-consumerism and the endless accumulation of stuff for its own sake disorient and disconnect us from our own humanity, and each other. One “proof” that consumerism tricks us into trying to fill emotional voids and needs with material objects is in the ways material things are advertised. It is well documented that, in trying to sell us things, advertisers appeal to our emotions and desires. And if you don’t think that the advertising companies have dug deep into the human psyche, just look at the billions of dollars they spend on psychological research in order to tap into (and shape) our emotions, desires, etc., and often create what is known as false needs. Advertising uses and exploits our (well-studied) humanity–our fears, desires, emotions, insecurities, need for social validations, vulnerabilities, etc–against us to transform us into customers, clients and audiences. They exploit our humanity in order to get us to consume, buy and watch things that often dumb us down and divert our attention away from other, much more important issues than the mere accumulation of stuff. Consumerism, corporate culture and advertising are ultimately very clever methods for continuously funneling money from people, because they attempt to fill an emotional or non-material void (i.e., need for love, acceptance, human connection, belonging, relationships, etc) with material things. And since the void is being filled by something that does not truly fit it and cannot satisfy it long-term, it is only a matter of time till we buy something new and try to fill it again, and then again and again and again. Psychologists and happiness experts have shown that new material possessions and purchases only sustain happiness for three months. This may explain why people are quick to go out and by the new version of the latest gadgets and cell phones, though there is little real change or improvement to them, after just a few months. Overall, consumerism it is a bottomless pit and never-ending cycle of trying to fill a non-material void with material things. We end up in an endless loop of wanting, spending/buying/consuming, temporary “happiness”, and then wanting and spending again. The result is a hyper-consuming, distracted population that spends lots of money and asks very few questions. It’s great for business (and political elites) but not so great for our hitherto unaddressed emotional and spiritual needs.